This wireless audio transmitter powered by USB port with auto charger transmits audio signals from your computer, portable CD or MP3 player, or other audio device to any FM radio. No wire is required between your computer and stereo system. No batteries required, uses power from any computer's USB port or from included cigarette lighter adapter. It can be used with any computer, notebook, PDA. etc., which has an audio out connector port. 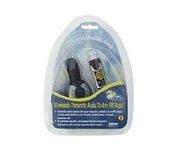 Cigarette lighter adapter allows you to listen to your favorite music from your notebook, MP3 Player, or PDA directly in the car without the use of clumsy cassette deck adapters.